Ned Lamont is tailoring his warning about Bob Stefanowski’s tax plan to every town in Connecticut with a dire calculation that could define the election as the governor hopefuls enter the post-Labor Day stretch. If you live in a typical house in Ansonia, for example, your local property tax bill could more than double from $5,600 to $11,400, Lamont figures. That’s based on a contention by the Democratic Party nominee from Greenwich that an outright end to the state income tax — as Stefanowski says he will do over eight years — could mean the end of all state aid to cities and towns. And that could mean radical hikes in local property taxes if municipalities didn’t slash spending. In Trumbull, a typical homeowner could pay $2,330 more, for an increase of 25 percent, Lamont contends. Ned Lamont says Bob Stefanowski could wipe out state aid to cities and towns if he eliminated the state income tax and corporate earnings tax. Stefanowski says that’s not true. 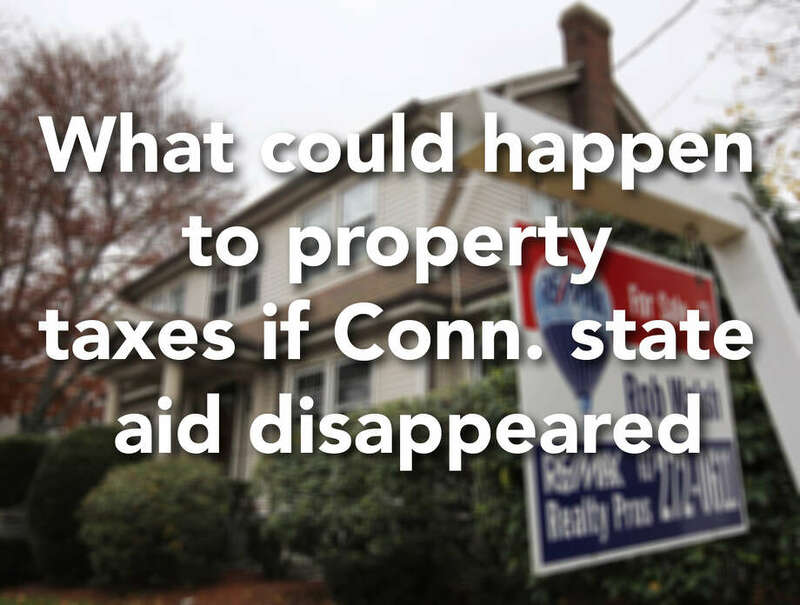 Regardless, here is what could happen if all state aid to towns were to disappear. Source: Ned Lamont campaign, state Office of Policy and Management | Figures for typical house values are based on U.S. Census estimate of 2012-16 average and Zillow.com. The cities and poor towns would suffer the most in Lamont’s view because they collect the biggest state aid packages. But upscale Ridgefield and Darien, for example, could each see their local levies rise by 22 percent, roughly $3,000 for typical homeowners, because of quirks in state aid formulas. Stefanowski, the Republican nominee from Madison, insists none of this doomsday scenario will unfold. He’s saying he would not cut education, but he isn’t saying exactly how he’d pull off the feat of ending the $10 billion-a-year income tax by 2027 and the $900 million corporate earnings tax even sooner. Here’s a hint: He can’t. Period. We’re talking pure La-la-land here. Lamont, for his part, did the math for his opponent, a former corporate finance executive, to show what it could look like if the impossible came true. In all, state transfers to cities and towns, and payments on behalf of the cities and towns, total $4.6 billion a year. That includes $2 billion in local school aid, the biggest piece, along with payments for teachers’ pensions ($1.3 billion last year), non-school aid and debt the state carries for the building of schools and other projects. Lamont’s conclusion: There’s no way to keep the state afloat under Stefanowski’s plan without eliminating much if not all municipal aid just for starters, with many deep cuts needed beyond that. After all, the taxes on Stefanowski’s hit list amount to 63 percent of all the money Connecticut will raise this year for its general fund. Nixing every penny of state aid — including bond payments, which the state can’t withhold — would make up for less than half the lost income, based on this year’s numbers. Right or wrong — and his numbers are correct as far as my double-checking could tell — Lamont is shining light on something even a lot of close budget-watchers don’t know: How much state payments and transfers are worth to each of Connecticut’s 169 municipalities. That in itself is notable, forget the controversy. Even in Greenwich, for example, not a town that fetches much cash aid from the state, the owner of a house worth $1.2 million receives $1,645 a year in value from the state every year. In New Haven, total state aid to the city amounts to a colossal $6,669 for the owner of a typical house worth less than $200,000. In dollars per town, we’re talking about nearly $300 million for New Haven, $70 million for Danbury, $37 million for Trumbull and $11 million in Orange — including teacher pension payments and in most cases, debt service courtesy of the state. No one thinks all that money would actually disappear from town hoppers. We saw a bipartisan revolt in 2017 when Gov. Dannel P. Malloy tried to foist $400 million in teacher pension payments onto the cities and towns, less than a third of what the state pays. So what woukld actually happen? Stefanowski holds to the logic-defying theory from his paid adviser, former Reagan economist Arthur Laffer, that economic growth spurred by lower taxes will make up for the lost revenue. Even if tax cuts did boost state coffers sharply under the current system — a hot debate with many economists and most evidence saying it wouldn’t — how would all that money come into the state if we eliminated the income tax and the corporate profits tax? The state government would have no way to pay for itself, rising economy or not, because the income tax is the door for prosperity to enter. Stefanowski, in a release last week, charged that Lamont was lying about citations in his claims about dire consequences. Lamont, of course, can’t know what Stefanowski would do. And so we have a game of Whack-a-Mole, as one campaign aide put it. Stefanowski makes a promise he couldn’t keep even if he were coronated as governor for life. Lamont makes an accusation of what Stefanowski would do, based on an assumption. And Stefanowski calls him on it, saying he would cut costs deeply. Here’s the deal: Some combination of absurdly deep cuts in state spending, including massive cuts in municipal aid, would have to happen — far, far deeper than any Republican has proposed in recent years. If it’s not this program, it’s that one. Thus, the game of Whack-a-Mole. As for his own tax plans, Lamont denies Stefanowski’s charges that he would raise the income tax, the sales tax and institute highway tolls. And Lamont says he wants to offer $400 million in property tax credits to help regular families. Can he prove Stefanwoski’s income tax plan would raise property taxes by 100 percent in places such as Ansonia and New Haven? Of course not. But in Whack-a-Mole, as we all know, the whacks keep coming.